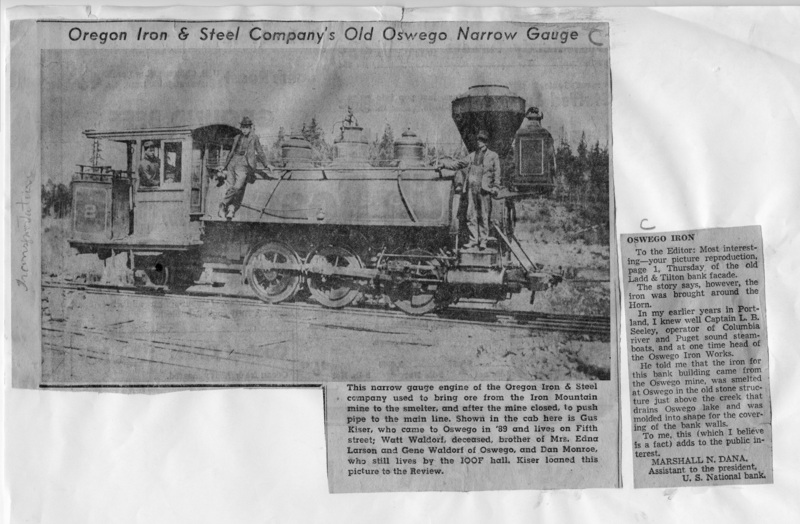 Description Yellowing news clipping; caption: Oregon Iron & Steel Company's Old Oswego Narrow Gauge. This narrow gauge engine of the Oregon Iron & Steel company used to bring ore from the Iron Mountain mine to the smelter, and after the mine closed, to push pipe to the main line. Shown in the cab here is Gus Kiser, who came to Oswego in '89 and lives on Fifth street; Watt Waldorf, deceased, brother of Mrs. Edna Larson and Gene Waldorf of Oswego, and Dan Monroe, who still lives by IOOF hall. Kiser loaned this picture to the Review. (news column on same page tells of the facade of the Ladd & Tilton Bank being made from Oswego mining iron ore.) See #5536 for B & W photo and negative.